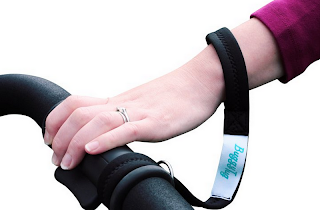 BuggyTug is a wrist strap that fits easily on any pram handle, it’s so comfortable that you will hardly notice it’s there, until maybe your pram starts to roll away! Made with neoprene and designed to the highest safety standards you’d be crazy not to add BuggyTug to your list of baby essentials. If your pram isn't one of the ones that has this sort of band attached then this is a fabulous safety feature, We live next to a big hill, and unfortunately due to trying to grab a bottle or something to keep K occupied I have found myself slightly letting go and him rolling and having to catch him! (Not good) but so easily done when you are on your own. This product allows you to have that peace of mind where you know you are still attached to your pram as accidents can happen, I feel they are reasonably priced for one at just £3.99 + £2.00 P&P Postage is within the UK only if you are situated anywhere else you can contact them directly on their website.